Eighteen ninety-two was a presidential election year in the United States. In that year, most parts of the American economy were expanding. But one part was not doing well: agriculture. The result was the birth of a new political party. It was called the People's Party. Its members were called Populists. This week in our series, Stan Busby and Maurice Joyce tell about the Populists, and how they campaigned against the Republicans and Democrats in the election. "There is something radically wrong in our industrial system. The railroads are making much money. Yet agriculture is failing. The banks are doing great business. Yet agriculture is failing. Towns and cities grow. Yet agriculture is failing. Wages were never so high. Yet agriculture is failing." Historians give four major reasons why agriculture was failing in the late eighteen eighties. One was the high cost of transportation. Second was high taxes. Third was falling prices for agricultural products. And fourth was the high cost of borrowing money. "People began to think, who had never thought before. People talked, who had never spoken much. Little by little, they began to study their condition. They discussed taxes on income. Government ownership of property. The unity of labor. And a thousand other opposing ideas." STAN BUSBY: Local Alliances formed larger groups. The larger groups included many persons who were not farmers, but who lived and worked in agricultural areas. These included teachers, doctors, repairmen, reporters, and church leaders. In eighteen eighty-nine, the major Alliances held separate conventions in Saint Louis, Missouri. They refused to form one big Alliance. They were divided on several important issues. MAURICE JOYCE: The chief issue was political. Leaders of the Northern Alliance had decided that agricultural interests could expect little help from either the Republican or Democratic parties. They believed the answer to their problems was a third national political party. Leaders of the Southern Alliance disagreed. They belonged to the Democratic Party. And, at that time, Democrats faced little opposition in the south. 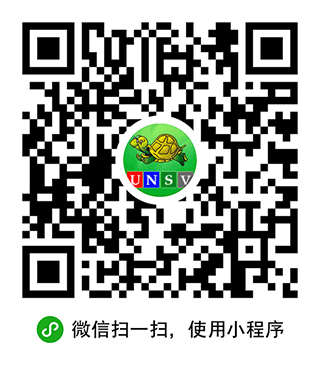 A new party would weaken their political power. So they wanted to work for change within the existing Democratic Party. STAN BUSBY: Another issue dividing the Northern and Southern Alliances was racial. How would a united Alliance deal with black farmers. The Southern Alliance did not permit black members. And it did not want blacks in a united Alliance. The Northern Alliance said blacks could join. The two groups could not settle their differences before the state and congressional elections of eighteen ninety. So, they did not campaign as one party. But they campaigned for one idea: help for America's farmers. Throughout the south and middle-west, they succeeded in electing agricultural candidates as governors, state legislators, Senators, and members of the House of Representatives. MAURICE JOYCE: Farm leaders everywhere were surprised by their election victories in eighteen ninety. They had not expected to win so much, so quickly. Leaders of the Northern Alliance decided the time was right to form one party to represent all farmers. They felt sure of success. For now, enough leaders of the Southern Alliance were willing to support the idea. 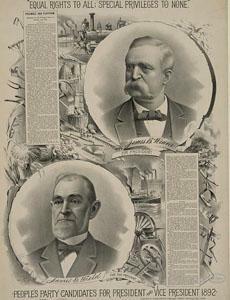 These southern leaders had succeeded within the Democratic Party. But they quickly learned that they held political power only at the local level. They held almost no power at the national level. So, a few months before the presidential election of eighteen ninety-two, America's agricultural Alliances held a joint convention in Omaha, Nebraska. They formed a new party. They called it the People's Party. They called themselves Populists. STAN BUSBY: Delegates to the convention approved a policy statement for the new party. The statement said the national government should own the country's railroads, telegraph, and telephone systems. It said the government -- not banks -- should supply paper money. And it said no limits should be put on government production of silver money. The Populists called for a tax on earnings. Fewer working hours for labor. Controls on immigration. To help farmers, the Populists demanded what they called the "Sub-Treasury Plan." Under this plan, farmers could put their crops in government storehouses. Then they could wait to sell the crops until prices rose. While they waited, they could borrow money from the government at low cost. They would pay back the loans when they sold their crops. MAURICE JOYCE: The new People's Party also proposed ways to make government more democratic. It said secret ballots should be used in all elections. It said Senators should be elected by the people...not chosen by state legislatures. Most Americans considered Populist proposals extreme. They felt the proposals were too close to socialism or communism. The Populists considered their proposals just. They felt their movement was a struggle for more equal control of the nation. On one side of the struggle were producers. These included farmers, laborers, and small businessmen. They were led by the new People's Party. On the other side were what Populists called non-producers. These included wealthy bankers and leaders of industry. They were led by the Republican and Democratic parties. Populists wanted producers to have some of the political power traditionally held by non-producers. They wanted producers to get a fairer share of the nation's increasing wealth. STAN BUSBY: The People's Party chose James Weaver as its candidate in the presidential election of eighteen ninety-two. Weaver had been an officer in the Union Army during America's Civil War. He had served in the House of Representatives. And he had been the candidate of a minor party in the presidential election of eighteen eighty. The Republican Party re-nominated President Benjamin Harrison. And the Democratic Party nominated former President Grover Cleveland. MAURICE JOYCE: The campaign began quietly. But a few months before the election, a labor dispute exploded into an important campaign issue. Several thousand steelworkers went on strike at a factory owned by the Carnegie Steel Company in Homestead, Pennsylvania. The steelworkers union called the strike after failing to reach a wage agreement with company officials. After months of growing tension, the head of the company sent three hundred private security officers to break up the strike and protect non-union workers. The security officers and many of the strikers carried guns. Shots were fired. Ten men were killed. 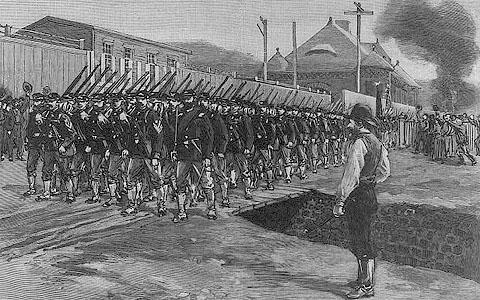 The governor of Pennsylvania immediately sent state soldiers to the steel factory. After a few more attempts to continue the strike, the union admitted defeat. Its power was crushed. It would be more than forty years before America's steelworkers were organized again. STAN BUSBY: A short time later, state soldiers were used to break up a strike by railroad workers in New York. And federal soldiers were used against striking silver miners in Idaho. This use of government troops to end strikes caused many citizens to vote against the ruling Republican Party. They voted for the opposition Democratic or People's Parties, instead. In the election of eighteen ninety-two, Republican President Benjamin Harrison was defeated. Democrat Grover Cleveland -- who had lost to Harrison four years earlier -- would be president again. The People's Party candidate, James Weaver, won one million popular votes and twenty-two electoral votes. MAURICE JOYCE: Grover Cleveland returned to the White House, just as his wife had said he would. But his second administration would be much more difficult than his first. Within two months of Cleveland's inauguration, the United States entered into one of the worst economic depressions in its history. BOB DOUGHTY: Our program was written by Frank Beardsley. The narrators were Stan Busby and Maurice Joyce. You can find our series online with transcripts, MP3s, podcasts and images at www.unsv.com. You can also follow us on Facebook and Twitter at VOA Learning English. Join us again next week for THE MAKING OF A NATION -- an American history series in VOA Special English.